Yup, I am still posting our Thanksgiving recipes...this is the last one though. We aren't that dedicated to a stuffing or dressing recipe. We as in my mother and I. My Nanny made the same cornbread stuffing forever, I never have liked cornbread and neither has my mother so...we just don't make it. 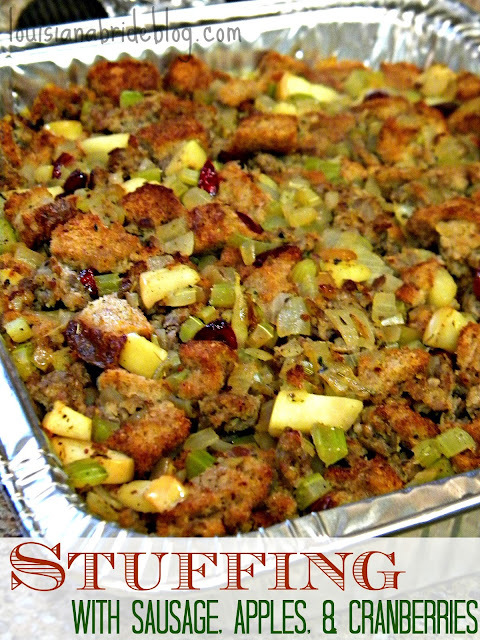 I like more of a bread stuffing and this year Mom did not disappoint in her discovery of this recipe. Whole wheat anything is my friend. Then again I need more whole wheat in my life right now. I've been carb loading like I have a marathon to run, and the leftover pizza that came home with us last night after the youth event caused for some midnight snacking that I had to question if I dreamed it or if I did it this morning. Apparently I was on that crazy sleep eating sleep aid and didn't know it. Cube bread and toast at 350 for 15 minutes flipping once. At the same time brown sausage, onions, and celery. Season with salt and poultry seasoning. When sausage is cooked through and onions are softened add the diced apples and cranberries. Cook for another 5 minutes. Add the sausage mixture, and 3/4 cup of broth to the bread in a large bowl and combine. Add more broth if the mixture seems too dry. Transfer stuffing to a greased casserole dish, cover with foil, and bake at 400 for 20 minutes. Remove the cover and bake an additional 15 minutes.